Historic musical rarities from the late 1960s & 1970s that aired on Legendary San Francisco radio station KSAN Jive 95. It's a benefit for the California Historical Radio Society, a non-profit dedicated to the education and preservation of radio history. 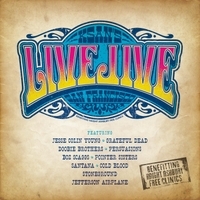 LIVE JIVE is a benefit CD pulled from an incredible music archive that includes hundreds of KSAN Jive 95 live broadcasts. What you’ll hear on LIVE JIVE is historic musical rarities from the late 1960s and 1970s by some of the most important musical artists of a generation. Santana from the very last night at the Fillmore West; the Grateful Dead from their 1972 New Year's Eve KSAN live broadcast from Winterland; and one of the very first Fillmore Auditorium performances of Jefferson Airplane are just some of the highlights. Proceeds from LIVE JIVE will go to the California Historical Radio Society, a non-profit organization dedicated to the education and preservation of radio history.